Congressman Ed Case represents 650,000 people, the only member of congress with such number, in the U.S. House of Representatives. Case’s job entails that—Hawaii being 5000 miles from the DC—federal budgets are being spent “appropriately in Hawaii in the right programs and at the right amounts”, making his role vital in the state’s development and progress. 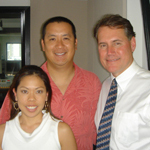 In this exclusive Greater Good Radio interview—his first media appearance after his announcement of running for senate—Ed Case speaks about his role as Hawaii’s advocate to the U.S. federal government. He also shares with us how his family became instrumental in his running for public office. Evan and Kari talk to Congressman Ed Case about how he has become a representative and his reasons for getting a career in government, plus, his most memorable and exciting moments in politics.